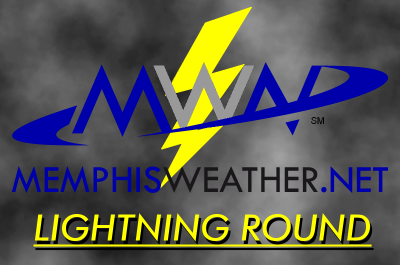 Time for another blog in the MWN Lightning Round series! First up... meteors! I know your first question is "what in the heck is Camelopardalids?" It's a brand new meteor shower - one that Earth has never experienced before, and it's tonight! The Camelopardalids meteor shower is produced by the Comet 209P/LINEAR, which was discovered in 2004. Because this is the first time the meteor shower has been visible to us, scientists are unsure exactly what to expect. However, people much smarter than us have reason to believe that the number of meteors produced could be from 30 to hundreds per hour! The best time to watch for them will be between 1-3am CDT tonight, but they could start appearing a couple of hours earlier and may be visible until the first peek of daylight Saturday morning. Though the meteors will appear to emanate from the constellation Camelopardalis (which is very near the North Star), you should be able to spot them nearly anywhere in the sky as long as you are in a place that is very dark. As for sky conditions, some high clouds may filter the sky a bit, but hopefully they won't be thick enough to obstruct the view completely. Temperatures overnight will be in the 70s. For more information, see this detailed article from the Capital Weather Gang or this piece from SpaceWeather.com. In a fairly high-profile glitch, the National Weather Service data dissemination systems failed late yesterday afternoon for about 30 minutes while severe thunderstorms were ongoing in the Northeast, specifically in the D.C. area. 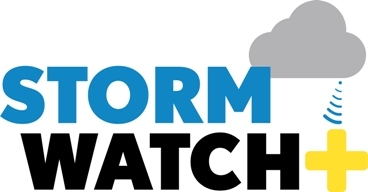 Traditional internet delivery of watches and warnings, as well as internet-based radar data, was lost from about 3pm until about 3:35pm CDT. The NWS blamed a firewall upgrade for the issue, but the fact that this occurred while Tornado Warnings were being issued in a major metro area leaves us scratching our head. The heat of this past week will continue right into the holiday weekend as high pressure over the southeast U.S. maintains a loose grip on our weather. The one fly in the ointment will be a "back door" cold front that slips down over the Mid-South by tomorrow, then washes out on Sunday. It's called a back door front because, rather than arriving from the typical west or northwest, it comes in the "back door" - from the northeast! The weak front could be just enough to spark a few afternoon and evening thunderstorms Saturday and Sunday before high pressure strengthens again on Monday. We don't think you should call off any barbecues or parties, but just keep in mind that a storm or two could be in the area and could produce brief heavy downpours or gusty wind. Highs will be in the 87-90 range through Monday with lows in the upper 60s to near 70. Humidity will not be quite to mid-summer levels thankfully! 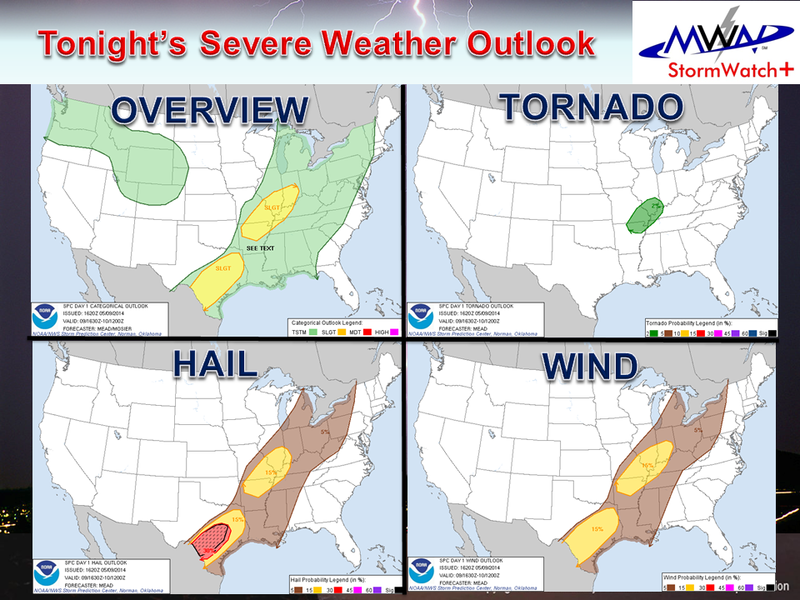 Click here (or here for mobile users) for the complete MWN Forecast and click here for the MWN Significant Weather Outlook outlining the thunderstorm threats for this weekend. An unusually cool few days culminated in a record low this morning and it appears the unseasonably cool weather will stick with us through the weekend before our first good spell of summer weather arrives next week. 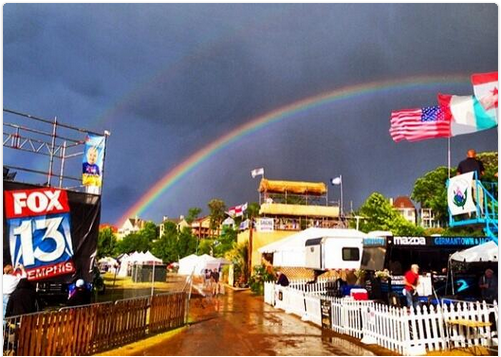 Unfortunately, cool weather also means unsettled weather and a few rain chances for Memphis in May BBQ Fest. First, I'd like to share a few pics I received last night as showers passed over the area around 5-6pm. The high-based showers (meaning the base of the clouds was fairly high) with sun peeking through the clouds and a stable layer of air beneath the clouds made for some interesting sky-watching and even a double rainbow! The clouds with round "nobules" or "sacks" below them were mammatus clouds, which are more commonly associated with severe weather, but which also form when falling precipitation encounters a stable layer of air, thus making the cool formations on the base of the clouds. 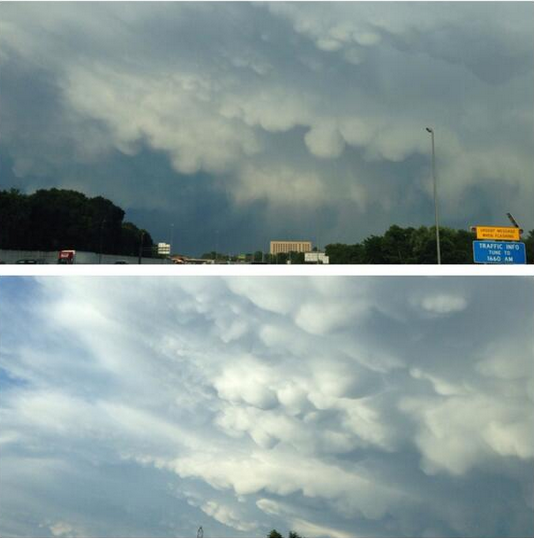 Mike H sent us these pics of the mammatus clouds on Twitter. Posted by the Memphis Redbirds Twitter account right before the first pitch last night! Looking ahead to the next 72 hours, the huge trough of low pressure at the mid and upper levels of the atmosphere will slowly break down and move east, but until it does, it means continued cool air over the area. Clear skies and light wind this morning allowed temps to fall into the mid 40s across the area. Officially, the airport dropped to 46, which breaks the record low for the date of 47 set last in 1967. Besides cool temps, the trough also has upper-level disturbances rotating around it. As we are in the base of that trough, the disturbances pass over and bring us rounds of precip, one of which occurred last evening. The next fairly strong one is due in tonight and will bring a better chance of showers overnight into the early morning Saturday. Though a shower is possible this evening, most rain will hold off until after midnight and end by mid-morning Saturday if not a bit quicker. one more, slightly weaker, disturbance arrives Saturday night, bringing another chance of rain late Saturday night into early Sunday. That should be the last chance of rain for some time as the trough moves east and a summer-like ridge of high pressure build in behind it for next week. The transition from trough to ridge is shown in the animation below, which depicts forecast atmospheric pressure and wind at about 18,000' up every 24 hours from this morning through next Wednesday. The yellows/red over the center of the country are this morning and that is the huge trough (it looks like a dip, or trough, in the pressure pattern). You can see that that area of yellows/reds weakens and shifts north, while a hill, or "ridge," or light browns moves east across the southern U.S. The south-central and southeast U.S. is under that ridge by Tuesday and Wednesday as it strengthens (light brown becomes pink). As that happens, the ridge warms temperatures and suppresses precipitation. In other words, a hot and dry week is ahead! Loop of 500mb (18,000') pressure pattern and wind, showing a significant trough being replaced by a large ridge. You can find our complete MWN Forecast, including temps that bottom out in the 50s this weekend and rise to near 90 by week's end, on our mobile apps and website. (A side note about the apps - new features are nearly complete and ready to release, so if you don't have the app yet, now is a great time to get it!) Enjoy this fine weather this weekend, keep an umbrella handy in the mornings especially, then get ready for an early taste of summer as schools let out and we head towards Memorial Day weekend! We've gotten a taste of early summer this past weekend with increased humidity, daytime temps in the 80s, and warm overnight lows. That all changes though as a cold front moves towards the region. A look at surface temperatures this morning shows a clear boundary through the central US separating the warm and muggy conditions we have been experiencing here and the much cooler and drier conditions across parts of the Plains. 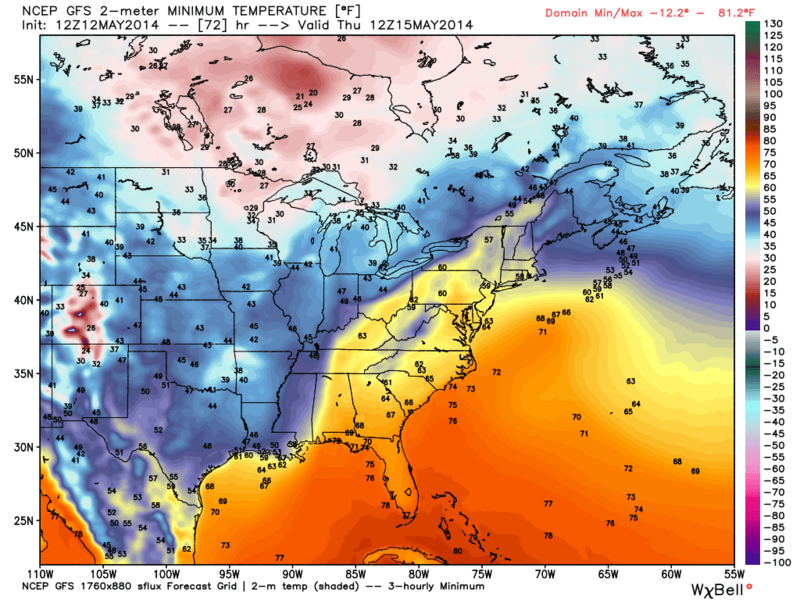 This temperature gradient is associated with a potent cold front for this time of year. As a result we can expect a good amount of rain as it approaches as well as near record low temperatures for this time of year (into the 40's in many areas!). We'll also take an early look at the BBQ Fest weekend forecast. Lets get into some specifics as to what you can expect in the Mid-South this week. 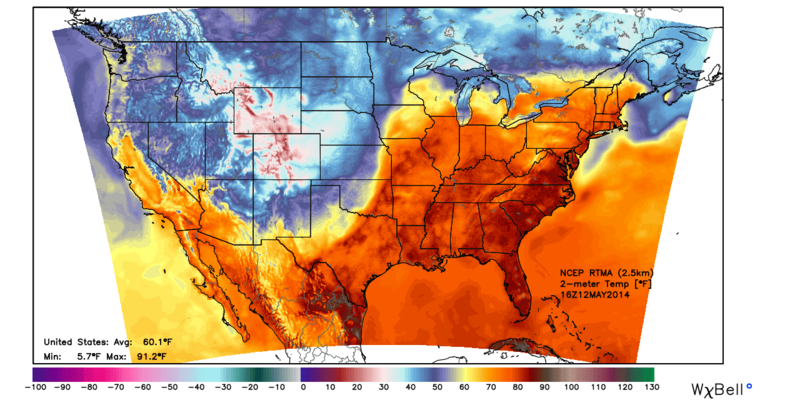 Surface temps at 11am CDT showing a cold airmass across the Plains and west and a very warm one in the east. Above you can see the potency of the aforementioned cold front. There is a very sharp gradient of surface temperatures where it quickly goes from 70 degrees to the mid 40's over a short distance. This front will not be quite as strong by the time it arrives here on Wednesday but it will still be rather significant for a mid-May storm system. Another factor worth mentioning is that once the front nears the area, it will have some trouble trying to continue moving through as the upper level wind parallels the front and low pressure forms on it just to our east. As a result, rainfall associated with the front could train over our area, which could lead to higher rain totals. Precipitation totals from one particular model (not a forecast) show rain totals right around 1 inch in the Memphis metro. There's a sharp gradient between values closer to 2 inches northwest of our area. We will have to keep an eye on where the heaviest precipitation sets up, as this area will feature the highest potential for flash flooding. Locations west of the MS River (including Crittenden Co in the metro) are already under a Flash Flood Watch due to this potential. Right now it looks like this area will stay to our west but we will be sure to let you know if that changes. Another factor that is surely on the minds of our readers is the threat of severe weather. Thankfully chances for severe weather look quite low due to the system weakening as it approaches the area. In fact, chances for scattered non-severe thunderstorms appear highest late tonight and tomorrow. By Wednesday, chances for rainfall will be the highest, but overall expect this activity to be weaker in nature due to less available heat for the storms to use as energy and low pressure that will stay east of the metro, putting us in the "cool sector" of the system. As you can see from the day 3 severe weather outlook above, the higher chances for severe weather are to our east where more energy from daytime heating on Wednesday should be present, as well as it's position in the warm sector of the developing low. Activity should wrap up Wednesday night, ushering in cooler temperatures for the end of the work week. Thursday morning looks to be the coolest of the week with temperatures in the upper 40's (over 10 degrees below normal and nearing the record low for the date!). High temperatures will also likely remain in the 60's on Wednesday and Thursday due to the much cooler air mass and rain on Wednesday. By Friday we should see highs return to the 70's. A brief note on BBQ Fest this weekend: Temperatures look great with highs in the 70's and lows in the 50's. However, an upper-level disturbance looks to come through the area this weekend which could bring small rain chances starting Friday afternoon. Any activity appears to be scattered and light at this time. Stay tuned to us for updates and check our forecast daily on the web or via our apps! With the first round of rain gone, all eyes turn west for the next chance of precipitation, which arrives overnight tonight. Though a stray shower is possible this afternoon, last night's activity has stabilized the muggy atmosphere for the time being. By this evening, scattered storms are expected to form across AR and southeast MO moving east to southeast. We feel the best chance for rain in the metro will be after 10pm, lasting possibly all night. Any showers and t'storms are expected to be scattered however and it's possible that some areas will see no rain overnight. We put the chance of rain after 8pm at 50%. As for the severity of any storms, the threat for large hail and damaging wind has diminished somewhat, enough that the Storm Prediction Center has moved the metro out of the Slight Risk zone, though close enough to keep the antenna up. The main threat from overnight storms will be dangerous lightning, brief downpours, and gusty wind. The Slight Risk zone has been moved just outside the metro, but a few strong storms are still possible overnight. Above are probabilities for tornadoes (upper-right), large hail (lower left), and damaging wind (lower right) within 25 miles. If you have outdoor activities planned for the evening hours, our recommendation is to go on with them, have an alternate plan ready, and keep a close eye to the sky and monitor our social media feeds below for the latest information. Anything that ends by about 10pm has a decent chance of being unaffected by rain. Heading into the Mother's Day weekend, previously advertised "likely" rain chances have diminished some. With the front still well to our west and no good "focus" for storm development, rain chances are in the 20-30% range now. Sunday has the best chance of staying dry all day. However, we'll trade rain for heat and humidity from the Gulf of Mexico as early summer-like conditions make an appearance. Unlike our mid 80s from earlier in the week, mid 80s this weekend will be accompanied by enough humidity to make things a bit uncomfortable. These conditions continue into Monday. By Tuesday, a slow-moving cold front with a cooler airmass behind it will infiltrate the region. Model differences exist on timing of rainfall, but Tuesday into early Wednesday appears to pose a risk for periods of heavy rain. We'll be monitoring this carefully. By late week, skies clear and we're back to pleasant conditions with highs in the 70s and lows in the 50s - just in time for BBQ Fest weekend! 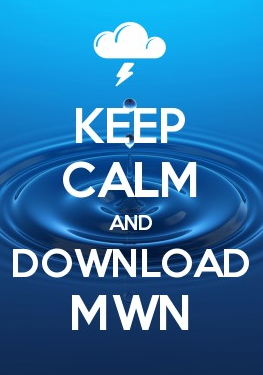 Click here for the complete MWN Forecast or check it anytime in the MWN mobile apps! In the meantime, keep an eye on MWN StormView Radar in our mobile apps or on the web for any storm development tonight! We've had a fairly extended period of dry weather following deluges and severe storms early last week. A few cool days were quickly pushed aside by warm high pressure with highs in the mid 80s for several days now, despite pleasant humidity levels that made mornings and evenings comfortable. As we head towards the weekend, it appears the dry weather comes to an end with rain and thunderstorm chances starting Thursday night. Severe weather is expected in the Plains today and Thursday and that will push east towards the Mid-South Thursday night and Friday. Fortunately, though, the severe weather threat will be lower here than to our west as the front responsible for the strong storms weakens a bit and stalls out without ever making it through the region. However, we'll still see showers and some storms move into the region overnight Thursday night into Friday morning, which is our best chance of rain the next several days. An enhanced risk of severe storms stays just west of the metro on Friday, though a few strong storms are possible and certainly heavy rain and lightning will be likely in the area. 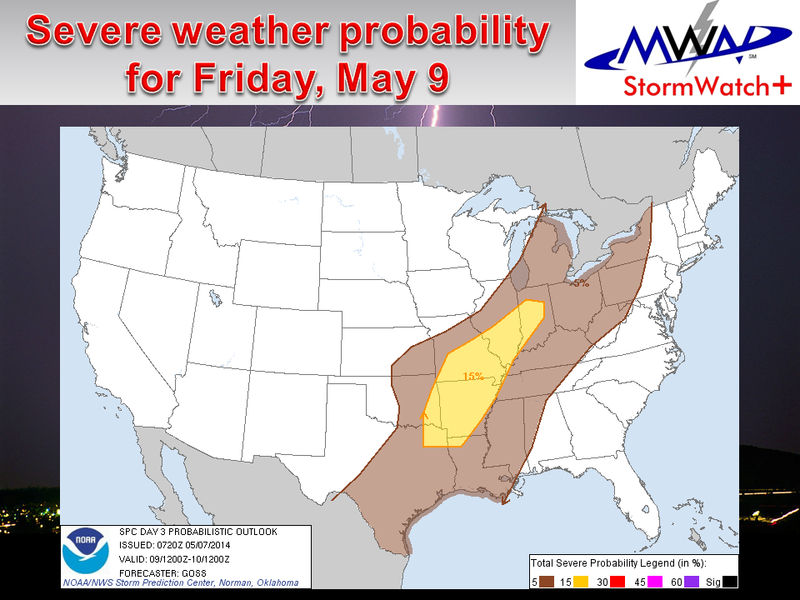 An enhanced risk of severe weather exists west of the MS River on Friday. Above, the probability of severe storms within 25 miles of a point, which is at 15% for most of AR. After the main round of precipitation ends sometime Friday morning, with the front loitering to our west, we could still see scattered showers or a few thunderstorms the rest of the day Friday into the evening. 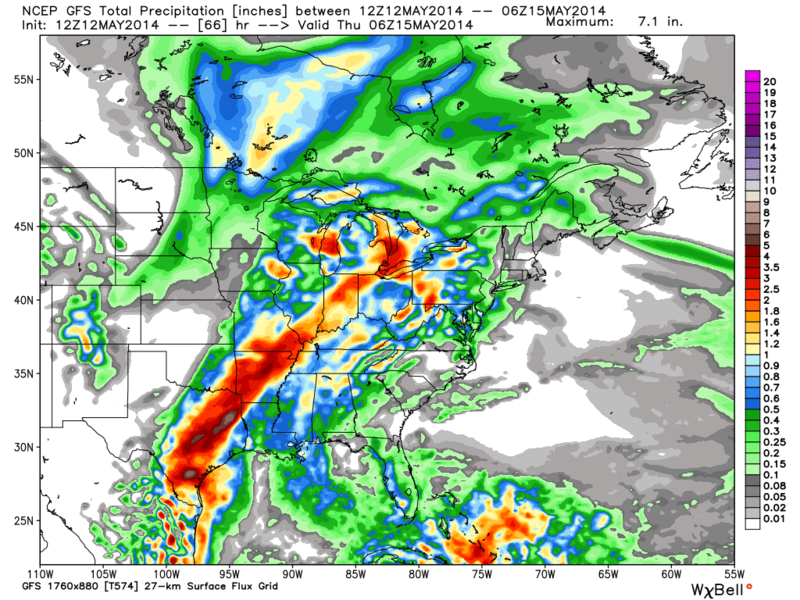 Mother's Day weekend appears to hold "unorganized" rain chances at this point. Some areas will stay dry and others will see intermittent showers. We don't suggest cancelling any outdoor plans for the weekend just yet, but it would be prudent to have a rain plan in case an unforeseen shower pops up overhead. Consult later forecasts and social media posts from MWN in case more organized activity appears on the radar. Outside of showers, it will remain warm and muggy this weekend with highs in the lower half of the 80s and lows in the 60s. Projected rainfall totals from tonight through next Wednesday, provided by NOAA. The Memphis metro could see up to 3-4" of rain when including Thursday night/Friday, any weekend rain, and the system early next week. One last round of rain looks to move through early next week, likely Monday night or Tuesday as a cold front finally pushes through the region. For the next week, rainfall totals of 2-4" are expected across the region. Behind the cold front next week, cooler weather (more seasonal, not cold) will build into the region under dry high pressure for the middle of next week. Full details for the week ahead can be found in the MWN Forecast and any hazardous weather in the coming three days can always be found in the MWN Significant Weather Outlook. Following well below normal temperatures in the first three months of the year, April offered only slightly below normal temperatures, making for an overall pleasant month. One temperature record was broken, the coolest maximum temperature on April 30th, which saw a high of only 58. Precipitation for the month was slightly above the long-term climate average with no records set or tied. The month was bookended by severe weather events on the 3rd-4th and 27th-28th, as well as strong storms on the 14th that brought microburst wind of 70 mph to Collierville. On the 3rd, a Moderate Risk of severe storms was forecast but afternoon supercells did not materialize and a Slight Risk carried into the overnight hours as a squall line affected mainly the city of Memphis and north MS. Some wind damage was noted in northwest MS and large hail fell in Fayette County. On the 27th-28th, multiple rounds of severe weather were expected and a Moderate Risk was again posted. As it turns out, the metro experienced a squall line around rush hour on the morning of the 28th with some wind damage and a brief EF-0 tornado in the Bolton community. The strongest storms and tornadoes stayed in AR on the 27th and across northeast and central MS into AL on the 28th. Comments: Zero days had below freezing temperatures and 5 days had maximum temperatures above 80. Comments: Two days had more than 1" of rain and five days recorded more than 0.50". Comments: One day had a low temperature below freezing and 10 days had high temperatures above 80. However, sensor issues for part of the month resulted in slightly elevated high temperatures during the maintenance period. Comments: Three days with more than 1" of rain and four days with more than 0.50". For skygazers and space weather enthusiasts, near perfect viewing conditions will exist tonight for the annual "eta Aquarid" meteor shower. 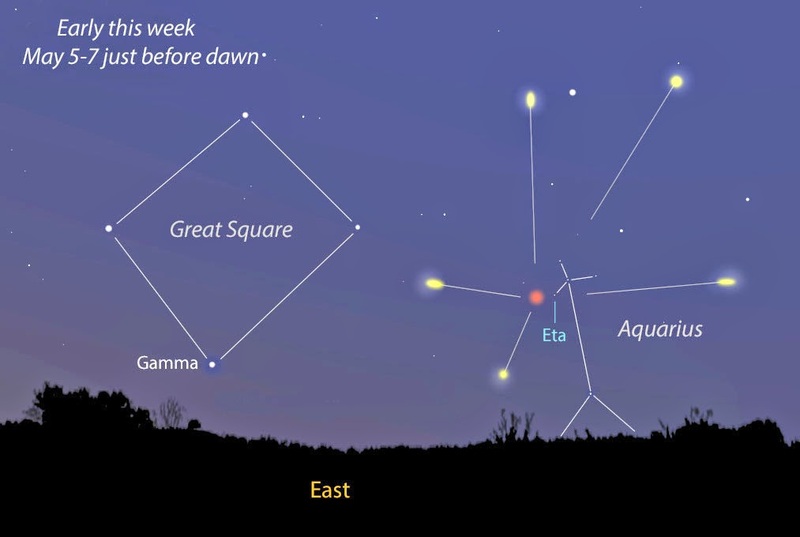 Though the southern hemisphere viewer will have a distinct advantage over those of us north of the Equator, several meteors will likely be visible in the early morning hours on Tuesday. The meteor shower is actually produced by flakes of dust or rock particles from Halley's Comet as Earth passes through a stream of debris left behind by the comet. The eta Aquarid name is derived because the meteors appear to be emanating from the constellation Aquarius in the eastern sky. The best viewing time will be in the wee hours Tuesday morning before the sun's rays start to lighten the sky prior to dawn. Viewing will be best if looking in the eastern to southeastern sky, so a location with a clear view of the east-southeast horizon is best. Though the meteors could be anywhere in the sky, their tails will all point back towards Aquarius in the east. Up to 10-20 meteors per hour could be visible. SpaceWeather.com says there is a decent chance of meteors of the "Earthgrazer" variety, which are widely known for their beauty - slowly skimming horizontally in a dramatic approach. The best time for Earthgrazers is 2:00-2:30am. If you miss the meteor shower tonight, there will be one more opportunity at the same time and location on Wednesday morning. Let us know if you make it out and see any meteors! 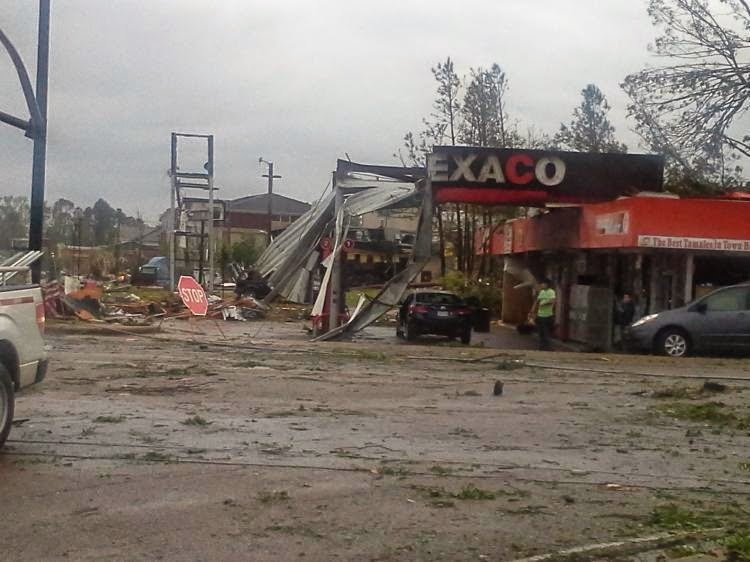 The National Weather Service has completed surveys of three Mid-South tornadoes that occurred on Monday, April 28 as severe weather swept through the region. The first occurred before 7am, embedded within the morning squall line, right here in Shelby County. An EF-0 w/ wind of 75-80 mph struck the Bolton community causing roof and tree damage. A Tornado Warning was issued for that storm as the first children were arriving to area schools, sending them straight to their tornado positions upon arrival at school. The second, and most publicized, occurred in the mid-afternoon hours, striking the city of Tupelo with 150 mph wind. The fast-moving EF-3 tornado was long-tracked, lasting 26 minutes and covering 24 miles. There was one fatality that has not been confirmed as a direct result of the tornado, as well as at least 40 injuries. The last twister occurred west of Union City during the late afternoon hours when most attention was focused tornadic supercells in central MS. An EF-2 with max wind of 130 mph crossed from Obion Co., TN into Fulton Co, KY. It moved a 700 lb weight 15 feet and bent a steel trailer. More information on all of these storms, as well as additional damage pictures, can be found on the NWS-Memphis website. 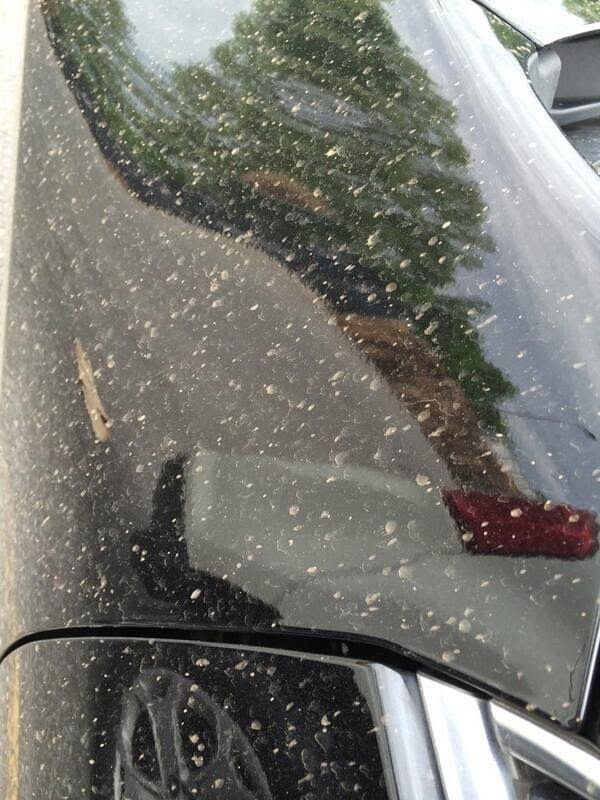 Mid-Southerners were surprised to see a dirty residue on their vehicles after light rain fell on Tuesday. After some research, we discovered that dust storms in the Plains were to blame! The dust was lofted high into the atmosphere and carried east on strong upper-level wind, then deposited as it fell into clouds and light rain over the Mid-South. When the sprinkles evaporated, the dirt was left behind! If you missed it, we wrote a more detailed blog on the topic Tuesday afternoon. Staying on the topic of mud... Mother Nature's calendar must be really messed up as it appears she forgot to schedule rain for this weekend's typically-muddy Beale Street Music Festival! In fact, the weather really couldn't be much better. No rain, actually very little cloud cover, is expected throughout the weekend with temperatures climbing from the lower 70s today to the upper 70s Saturday to the mid 80s by Sunday. One thing you may not have needed at many other music fests in recent history that will be a necessity this weekend? Sunscreen. Let's hope the weather is as good in 2 weeks for the BBQ Contest as well as the following weekend for the Sunset Symphony! 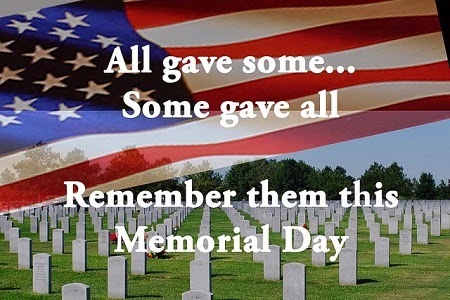 We hope everyone has planned some outdoor activities for this great spring weekend in Memphis, TN!